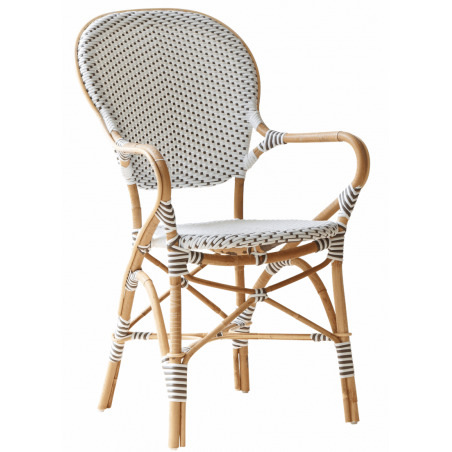 Rattan bistro type dining chair with arms. Hand woven by skilful craftsmen, the Sika Design Isabell Dining Chair with Armrests consists of a rattan frame with braided man-made fibre in contrasting colours that are chosen carefully to match the natural rattan. If you are in love with France and its brasseries, this chair will be a good reminder. Use in your kitchen extension, dining room or conservatory for a relaxed look. A good-looking practical chair that is easy to clean which is perfect for a family dining room. The chair can be used outside in the patio in the high summer but should not be left out all year around. Please check out the outdoor version. Materials: Rattan frame, man-made fibre weaving. Dimensions: W: 54 D: 57 cm H: 92 cm seat height: 45 cm, armrest height 64 cm.